Hyatt is adding the Northstar Lodge Hyatt Residence Club to their portfolio. It will be located at the Village at Northstar, a development within the Northstar-at-Tahoe ski resort on the north end of Lake Tahoe, CA. Fractional ownership starts at $90,000 and occupancy is scheduled for winter 2008. Their location is ski-in/ski-out and membership includes access to the Tahoe Mountain Club and the golf course at Old Greenwood. Pre-sales begins December 15, 2007. East West Partners, in partnership with Global Hyatt Corporation and Morgan Stanley Real Estate, announce the development of Northstar Lodge ~ Hyatt Residence Club, representing the latest real estate offering at the new Village at Northstar™, located in the heart of Northstar-at-Tahoe™ ski resort. Construction is underway with first occupancy set for winter 2008. 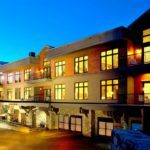 Northstar Lodge ~ Hyatt Residence Club is the latest property in East West Partners' impressive Tahoe Mountain Resort brand, which includes The Village at Northstar, Old Greenwood, Gray's Crossing, and The Highlands. All four year-round resort communities are located in the North Lake Tahoe, Calif. area. Northstar Lodge ~ Hyatt Residence Club is a private residence club (PRC) offering the rare opportunity to own a luxurious mountain retreat at a fraction of the cost of a whole-ownership vacation residence. The Northstar Lodge ~ Hyatt Residence Club is the last of its kind of real estate offering at the Village with its fractional offerings starting at $90,000. These ski-in/ski-out upscale condominiums range from 1,250 to 1,800 square feet. Honoring the architectural heritage of Lake Tahoe, the condominiums will make ample use of native materials on the exteriors and luxurious appointments within. The residences will feature hardwood floors, marble countertops, luxury Viking® appliances, the latest in home electronics, large decks with outdoor fireplaces and a window wall framing stunning mountain vistas. The Northstar Lodge ~ Hyatt Residence Club will be built to earn the Leadership in Energy and Environmental Design (LEED) rating, the nationally accepted benchmark for the design, construction, and operation of high performance green buildings from the U.S. Green Building Council. Distinctive amenities will include a 2,500-square-foot fitness center with year round swimming pool and spas, private lounge and media theater, and ski and boot valet. A new gondola, just steps away from the Northstar Lodge ~ Hyatt Residence Club, will provide direct skier access to all of the Northstar mountain and the Northstar Highlands, a new mid-mountain community featuring The Ritz Carlton hotel, as well as distinguished townhomes and condominiums. The Village at Northstar's way of life is well-suited for those desiring to be in the center of it all. Evoking a delightful European charm, the Village features 60,000 square feet of specialty retailers and restaurants, including cafes and art galleries all circling a 9,000 square foot ice skating rink. Just beyond their front doors, owners can choose from an array of fine restaurants; take in a live concert from the stage overlooking the ice rink; or attend an annual festival. Or, they can choose to simply enjoy hot cocoa and roasted s'mores with family and friends at rink-side fire pits under draped cabanas with outdoor cushioned chairs and sofas. The Village's location in the heart of North Lake Tahoe will offer family adventures for every season–from snow skiing, hiking and mountain biking, to fly-fishing, horseback riding and water sports on legendary Lake Tahoe. Concierge services, daily housekeeping, valet parking, continental breakfast, complimentary shuttles, and daycare referrals are provided to all Northstar Lodge ~ Hyatt Residence Club owners. – Alpine Club&#8212 exclusive members-only lounge overlooking the Village at Northstar. Northstar Lodge ~ Hyatt Residence Club owners will also have access to 13 renowned Hyatt Residence Clubs and affiliates such as such as Carmel, Aspen, Beaver Creek and Sedona. Pre-sale reservations will be available on December 15, 2007 with substantial purchase incentives, Charter Member benefits, and best selection options for early buyers.